Ace Fleming, his mother Alexandria Fleming, and members of a first responder team that helped save his life when he went into cardiac arrest at the school on Nov. 30. 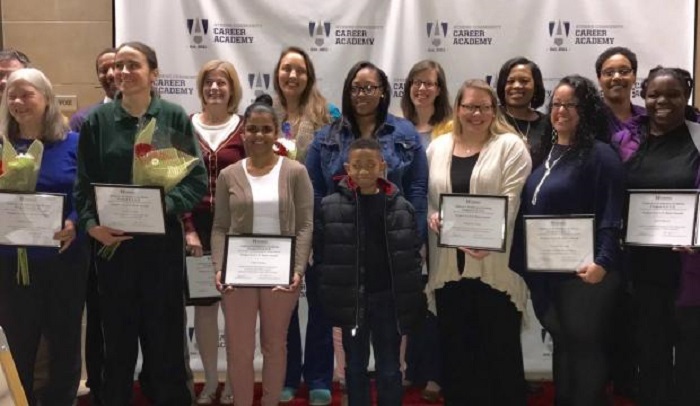 Teachers routinely do more than just teach the children in their charge, but what a team of Clarke County teachers and other school workers did Nov. 30 went far beyond the normal call of duty. “The school, the team, basically saved my son’s life,” said Alexandria Fleming, mother of Fowler Drive Elementary School second-grader Ace Fleming. Ace is an active child who loves basketball and dreams of becoming a scientist or doctor one day. He likes action figures, Spider-man and video games. “He’s a normal 7-year-old,” his mother said. A little less than half of Georgia’s schools participate, about 1,250 in all, said Richard Lamthier, who manages Project Save for Children’s Healthcare. All of Clarke County’s schools are recognized as “heart-safe,” he said. Team members have training sessions twice a year, and scramble into action during surprise blind drills, when the team members don’t know if it’s real or not until they respond to the emergency. That preparation made all the difference for Ace, said his mother. Just before noon that Thursday, as children were lining up to go back inside after recess, Ace lay unresponsive on the ground. He had gone into cardiac arrest. Coach Mollie O’Neal called into the office to call 911 and notify the school’s own first responder team, trained in the kind of rapid response to a heart attack that can be the difference between life and death. As Ace’s second-grade teacher, Tava Aziabor, led the rest of the class back inside, the Project SAVE team rushed into action. School nurse Sara Oehlerts, new school secretary Jennifer Miller, PE teacher Pauly Shenton and kindergarten teacher Donna Spangler administered CPR to the child as paraprofessional Janell Bloom and instructional coach Mia Jordan relayed EPI pens and a device called an AED to the first responders on the playground. Science teacher Richard Woodward, another team member, stood by as an alternate. The AED, or automated external defibrillator, administers electricity to stop cardiac arrhythmia and give the heart a chance to re-establish a steady rhythm. The Project SAVE teams are trained in its use, and the device got Ace’s heart going again. As the first responders worked in the playground, Carla Fonseca, who was training her replacement as school secretary, and receptionist Christie Navarro were on the phone in the front office with Fowler Drive Principal Anissa Johnson. Navarro called 911, and then Ace’s mother, who arrived at the hospital before the ambulance did, Johnson said. In minutes gifted education specialist Stephanie Towe and media specialist Melissa Solomon were directing an ambulance to the school’s playground. From there National EMS paramedics took over, rushing Ace and Fowler Drive Elementary assistant principal Stacie Carson to the emergency room of Piedmont Athens Regional Medical Center. From Athens Regional, Ace went by helicopter to Children’s Healthcare of Atlanta’s Egleston Hospital, where doctors confirmed the suspicions of Ace’s pediatrician. He had been complaining of chest pains, and just the day before his heart attack, the pediatrician had said he needed to see a heart specialist. But they hadn’t had time to make that next step, his mother said. Surgeons at Egleston found and removed a benign growth blocking the flow of blood in Ace’s heart, and installed a pacemaker, she said. Now the prognosis is good for Ace, his mother said. Clarke schools have had this kind of first responder team as long as Johnson can remember in her more than 20 years as a teacher and administrator, she said. But she never thought there would be a time to use the training she and the first responders get. This was a true life or death emergency, agreed Amy Roard, director of nursing services for the Clarke County School District. “It really takes a team,” she said. Cardiac arrest in schools is rare. They happen 15 or 20 times a year statewide, Lamthier said. But those heart attack victims are almost always adults. Lamthier honored the team’s members for a job well done at a meeting of the Clarke County Board of Education earlier this month, awarding each a “Hero” certificate from Children’s Healthcare. School board president Charles Worthy was moved to give roses to three of the team members. Fleming said she hopes other schools will hear her son’s story. “I just hope it helps someone else,” she said.